Grow up Australia supports the introduction of an R18+ rating for video games. We believe that adults are responsible enough to protect children from inappropriate material within the home. Our view on the government’s plan to censor the internet is a similar one. This week over 450 websites are participating in The Great Australian Internet Blackout. An initiative that seeks to raise awareness and urge people to speak out against internet censorship. Internet service provider iiNet are participating as are the Greens. Below are some points copied from GetUp! A form is provided on the GetUp! site to help you send your views to Senator Conroy. The scheme is opposed by child welfare charities, civil liberty groups and professional bodies – and with good reason. Both the mandatory blacklist and the optional filter miss the vast majority of unwanted content, which is normally shared using email or file-sharing networks – not through web traffic. ISP filtering will detract resources from tackling child abuse and waste tens of millions of dollars. Senator Conroy has reneged on a promise to have a public consultation process on his proposed mandatory internet censorship scheme. His alleged public consultation is narrowly limited to one aspect of the scheme, and does not invite question of the central issue, which is whether to have a mandatory internet filter. GetUp! has gathered over 120,000 petition signatures in opposition to mandatory internet censorship scheme. There are plenty of alternatives – like distributing software to parents to use at home, or making the filter opt-in rather than mandatory. Alarmingly, the Department has indicated that it may not publish all submissions, singling out submissions made by individuals using online tools like GetUp’s website. In short, they are threatening to censor a public consultation on accountability and transparency. Grow up Australia has just been informed of an event in Sydney that has been organised for tomorrow. The event is being organised by a new Pro R18+ website R18+ Games Australia and aims to raise awareness about the discussion paper and encourage people to get involved in the public consultation. 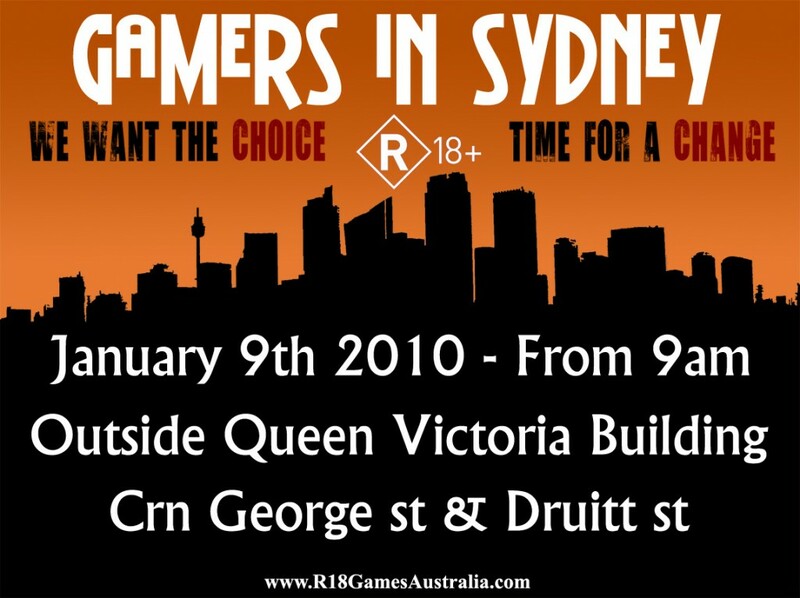 R18GamesAustralia.com was created by Luke Lawrie who writes for Australian Gamer. There is also a Facebook Event you can join if you plan on attending tomorrow. Below is the content of the email that we received today detailing the event. Hope to see you there. Gamers and non-gamers alike will be taking to the footpaths outside of the Queen Victoria Building in Sydney on Saturday the 9th of January to raise awareness about the Australian Government’s recent discussion paper regarding the classification system for video games in Australia. The discussion paper calls for public response to the current system which, unlike that of many other nations, does not include an R18+ rating for the video game medium. This event aims to encourage participation and public response, with copies of submission forms available. Information sheets about video games, including details about the current and proposed classification system will be made accessible on the day. Will 2010 Be The Year? Will 2010 be the year Australia introduces an R18+ classification for computer games? As a result of passionate individuals voicing their opinions via blogs, social media and old fashioned word of mouth we have enjoyed a huge increase of awareness in the greater population. Due to the boost in interested people we have also seen more exposure on television, radio and in popular publications. In 2009 numerous letters were sent to Attorneys-Generals and rallies were organised. Even a political party was formed to challenge Michael Atkinson in the upcoming state election. A petition was set up on a Queensland Government website with the intent on exploiting a possible loop-hole in a State Act. Most significantly The government finally released the highly anticipated discussion paper and are undergoing the public consultation that they promised. This valuable opportunity to voice your opinion expires on the 28th of February 2010. You can participate directly by downloading the forms available on the Attorney-General’s Website or you can use our Online Form. With the government appearing to take an interest It’s easy to be lulled into inaction. Individuals need to continue to raise awareness. This can be as simple as raising the topic with a friend or family member. A number of games expected to be released this year are likely to have problems qualifying for MA15+, our highest possible rating for games. Six Games were Refused Classification in 2009 . In the early days, there was Pong’s black and white tennis game, Space Invader’s alien shooting adventure and Pac-Man’s world-renowned yellow blob. Now, fast forward nearly 40 years and times have changed. Australians spend more money creating virtual cities and obliterating hidden zombies than at the movies. Interactive gaming is the new black – no matter your race, gender or culture. And what’s more, the games itself have grown increasingly sophisticated. Two dimensional, black and white games are a thing of the past with the array of next-generation releases containing rich graphics, dynamic characters and compelling storylines. With the average Australian gamer 30 years old, it’s no surprise that more and more games carry mature themes. But what does come as a shock to many is that Australia is the only developed country without an R18+ rating. Films, which fall under the same classification system, can be granted an R18+ or even X18+ rating but this is not the case for computer and video games. If a game exceeds the MA15+ rating, it is either refused classification or modified to fit within the rating guidelines. If the deadly Mafia series The Godfather which is clearly not the romantic drama Gone With the Wind can be considered one of the greatest films in cinematic history why can’t the same thinking apply to games? Our classification system needs to be changed so adults can play games as they were meant to be played. The Commonwealth Government has released a discussion paper to canvas public opinion on the possible introduction of an R18+ for Computer Games. You can participate in this public consultation by using our submission form . Don’t forget to spread the word! This form will no longer be available after the 14th of February to allow adequate time for collating responses and submission prior to the final deadline of the 28th of February. Be sure to show your support by joining our Facebook and Steam groups! The Commonwealth Attorney‑General’s Department has finally released the Discussion Paper on the R18+ Classification for Computer Games. The public are invited to make submissions on the matter up until the 28th of February 2010. Computer games should be treated differently from films given the specific, negative effects of interactivity on players, particularly their participation in violent and aggressive content. It would be difficult for parents to enforce age restrictions for computer games. Minors would be more likely to be exposed to computer games that are unsuitable for them. An R 18+ for computer games would exacerbate problems associated with access to high level material in Indigenous communities and by other non‑English speaking people. There is no demonstrated need to change existing restrictions. The R 18+ classification category sends a clear, unambiguous message to parents that the game material is unsuitable for minors. Consistent classification categories for films and computer games are easier to understand. A new classification will supplement technological controls on minors’ access to age-inappropriate computer games. Adults should not be prevented from playing R 18+ level computer games simply because they are unsuitable for minors. Consumers access games which would be R 18+ illegally – it would be better if they were legally available with appropriate restrictions. Comparable international classification systems have an adult rating for computer games – international parity is desirable. You can download the entire discussion paper and a template for making a submission from the Commonwealth Attorney‑General’s Department’s website.